Located in the heart of the Asian continent between China and India, Tibet is a region with a complicated political history that has been a part of the People’s Republic of China since 1951. Religion, specifically Tibetan Buddhism, is extremely important to everyday Tibetan life and is derived from the ancient Tibetan religion Bön and Sanskrit Buddhism from Northern India. Tibetan Buddhism has become increasingly popular in the west due to Tibetan emigration. 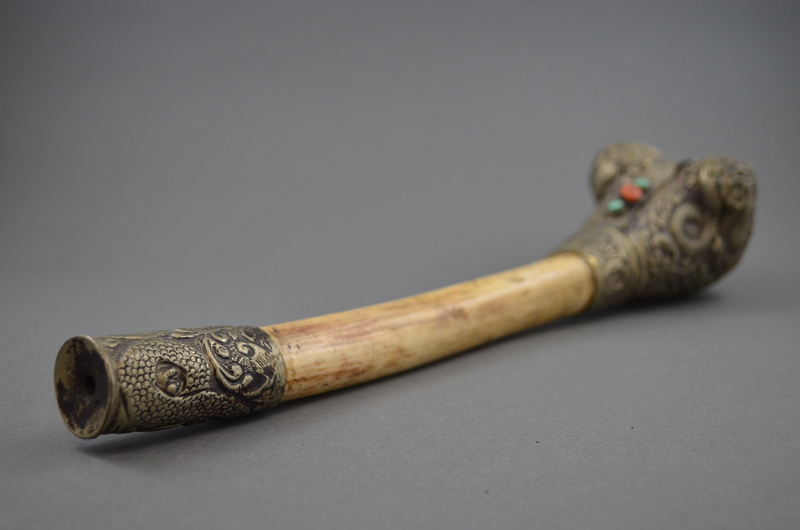 Rituals and ritual artifacts are important in Tibetan Buddhism, with the artifacts believed to hold tantric powers that determine how successful the ritual will be. Several of these ritual artifacts are made using human bone; these artifacts include the damaru, the kangling, and the kapala. 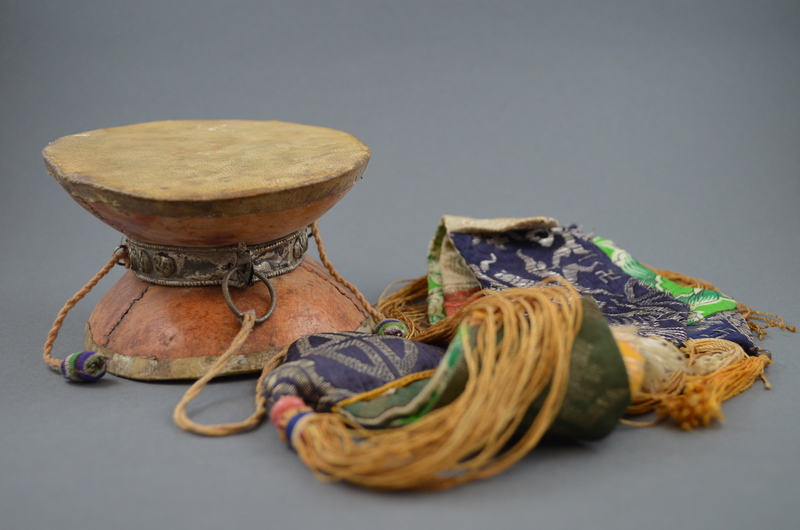 The damaru is a two-headed, hand-held drum that is made from two skulls, a male and a female, which represent the male and female elements of life. These elements are further represented through the male and female mantras that are inscribed on the inside of the corresponding skullcap. This ritual instrument is held in the right hand and is often paired with a bell (ghanta) to create a musical offering to the deities at the center of the ritual. A traditional Tibetan damaru. Beasley-Hwang collection. The kangling is a trumpet traditionally made from a human femur (kangling literally translates to “bone flute”). Said to have a haunting sound, the kangling is typically used in rituals to summon spirits in order to help relieve their worldly sufferings. 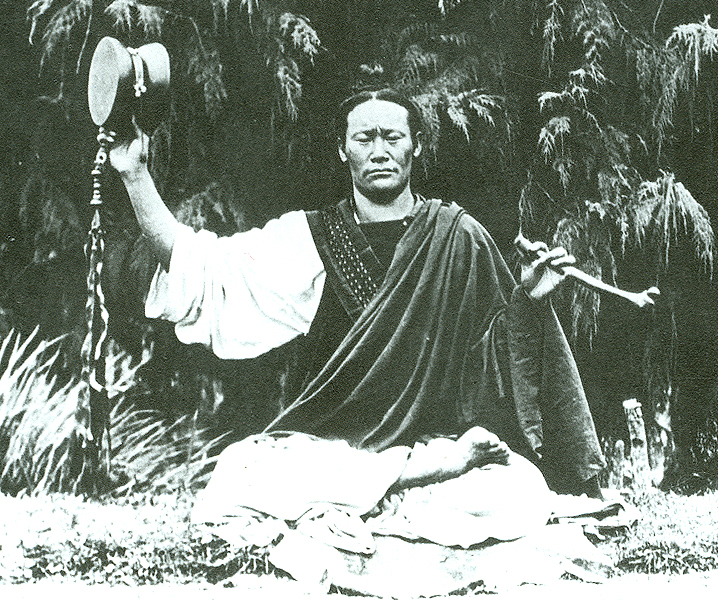 A damaru and kangling used together in ritual. A kapala, or skull cup, is used to hold offerings of herbs and flowers that are mixed with various liquids; this mixture is symbolic of aspects of the body and mind. The skull cup is supported by a triangular base with a skull decorating each corner; these skulls represent the three vices (greed, hate, and ignorance). 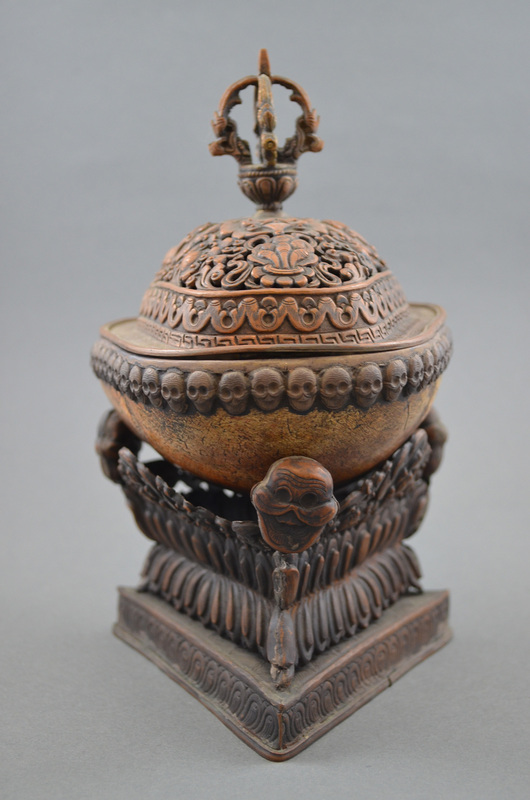 The kapala is topped off with a crown-shaped lid that represents the enlightened body. An intricately decorated kangling. Beasley-Hwang Collection. These instruments are used in chöd ritual, a practice that combines Buddhist meditation and an ancient shamanic ritual native to Tibet and is primarily found in Tibetan Buddhism and Bön. The goal of this practice is to get rid of the Ego, which starts with disconnecting from the body and material objects. A Tibetan kapala, complete with separate triangular base and crown-shaped lid. Beasley-Hwang collection. While these artifacts are traditionally made from human bone, they may also be made from wood. When made from bone, the selection is very important to how much power the artifact has and the success of the rituals it is used in; it is believed that the karmic force of the deceased remains in these skeletal artifacts and is transferred to those who use them in ritual. For example, the bones of an individual who died violently are believed to hold the greatest power while those of someone who died a peaceful death have almost no power; the bones of a respected teacher are also thought to be powerful in ritual use. While it can seem almost morbid to use skeletal remains as ritual objects, these are often seen as the most powerful cultural objects. This is evident in the amount of decoration and symbolism included in the artifacts described here. Editor’s Note: Kathleen Terris worked with Houston Museum of Natural Science Curator of Anthropology Dirk Van Tuerenhout and recently joined the collections department as a part-time member. I have a piece , not sure about it. If you could give me information , and value. I’d sure appreciate it.